If you're one of the 700 or so people who bought tickets to fly to outer space on Richard Branson's Virgin Galactic rockets, don't pack your space bags just yet: Smithsonian notes that the company doesn't have the Federal Aviation Administration permit required to take passengers to space. Hope you folks got traveler's insurance. Or kept your Bitcoin receipts. The regulatory regime which governs Virgin Galactic's vehicles in their test flight program and under which Virgin Galactic will operate in commercial service, was established by the U.S. Federal Government in 2004 and is administered by the Federal Aviation Administration (FAA) Office of Commercial Space Transportation (AST). 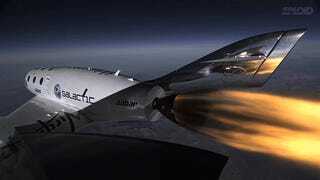 Throughout Virgin Galactic's commercial program development and testing, it has collaborated with commercial industry and the AST to develop a regulatory framework for the commercial spaceflight industry. Virgin Galactic's new vehicles have already completed multiple test flights and generated a large quantity of flight data – made possible by the award of a FAA Experimental Permit. Securing this permit was the first stage in Virgin Galactic's ramp-up to commercial service, confirming the vehicles' suitability for test flight relative to required public safety standards. As anticipated by both Virgin Galactic and the AST, the second stage of the licensing process for Virgin Galactic will be to gain the FAA Commercial Operator's License, which will verify the vehicles for public service under a regime of informed consent for its paying passengers. Virgin Galactic is in regular communication with the AST to ensure it is in compliance with all license requirements. The application process is well under way and Virgin Galactic is confident that the FAA award will be made in good time for it to begin commercial service later this year.